Untamed Gardens is an exhibition of works by Brisbane-based photographic artists Renata Buziak and Vivienne Kelly. Both artists are influenced by their surroundings and look closely at the structures of plants and their influence on the local urbane and natural environments of South-East Queensland. Kelly's photographic landscapes emphasise relationships between marine forms and suburban local species of plants found on land. Reference to the ‘aquatic’ in her works make places such as creeks, mangroves and beaches the subject and locations for her photographs. She uses light as a symbolic and constructive element to transform those familiar landscapes into ephemeral and surreal interpretations. Buziak's ‘biochromes’ created by natural processes reveal nature’s transformative and fractal qualities. 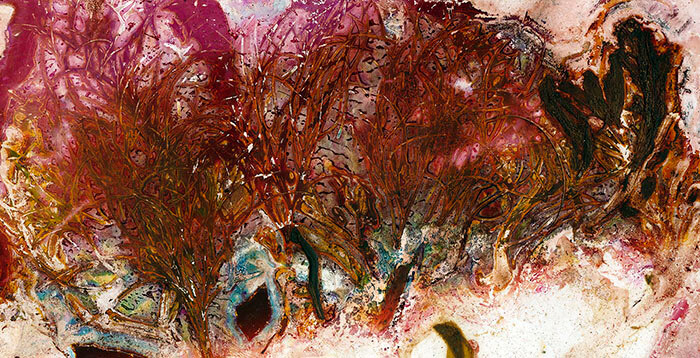 Her style captures Stradbroke flora in its various stages of decomposition depicting images of aerial and micro worlds. These works present us with a spectacle of colour and allow us to explore and study the fascinating shapes and forms produced by the unique flora found on this remarkable island. Buziak and Kelly have collaborated to produce two separate bodies of work that celebrate everything found in the 'Untamed Garden'. The photographic artworks found in this show were all achieved on location at Stradbroke Island where the artists worked together to capture and record the diversity of plants growing freely and untamed along the ocean-front and shore-line, making this exhibition a unique dichotomy and presenting us with a new way of appreciating our natural surroundings through photography. More images coming soon. All works are available for sale, please inquire from the 'Contact' page .